Elop: – Front cams for next Lumia and more (nfc, dualcore?). MeeGo in lab, stay tuned for what comes out. 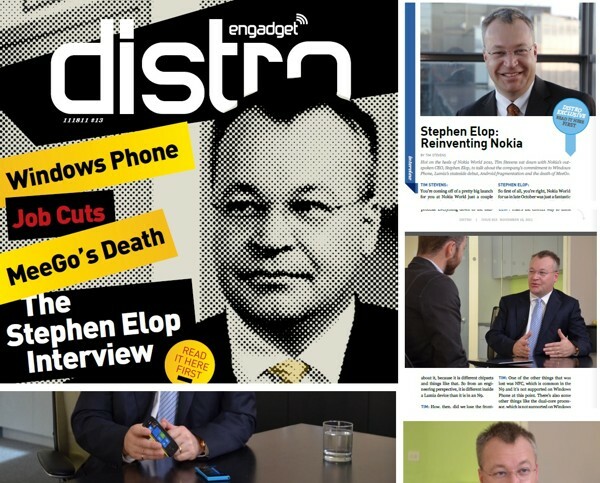 Front page of this week’s Engadget magazine is Stephen Elop. You can download it in various formats. On the PDF, it’s pages 44-57. Lumia – It’s about the promise of the Nokia brand and what it stands for. Fragmentation not just a buzz word. A real concern in any operating environment. Thinks skinning might be confusing for the developer and consumer (it’s funny when I see mates with different Androids and they’re like, but mine can’t do that. Mine doesn’t do this on the homescreen :S) On WP, there’s minimal relearning. Not surprised by the response to N9. Reiterates what’s been said many times – elements of N9, the design, the user experience, swipe (lol not the Swype experience as in text) as well as the Qt environment. Those will live on in future Nokia products. Beauty of N9 and put windows phone in it. That’s exactly what we did. We’ve also given some clues about the Qt development platform. Stay tuned, it’s going to be very interesting. The idea of having devices for connoissuers, high end devices and speciality devices is something you will see from Nokia, there will be examples of that. What we’ve said about the underlying MeeGo environment is that it’s moving into the lab. Who knows what comes out of the lab. Stay tuned for that, but nonetheless, you’ll see some interesting speciality things over the years ahead. On things WP doesn’t currently support – e.g. NFC, or dual core. Tim asks is that frustrating? Elop says NO as they have a good visibility into and influence on future of WP. Elop knows what’s coming, what’s ahead and know different timiongs for different markets. At end of the day though, what Nokia needs is to land well is the quality of the overall experience. Speaking dual-core/single core – in terms of experience in Lumia 800 against those devices with “more power” I’ll put our experience against any other experience ALL DAY LONG. (Damn right. Symbian fans have said it time and time again, and now it’s really true with WP too that it doesn’t need super high end hardware. It would be nice to brag about and add some inches to your ego but the old gen are already fast…and the Lumia is even faster. Remember in several reviews this was highlighted, e.g. Jon Rettinger of TechnoBuffalo made this exact point). User experience is king. Not list of features, what it can or can’t do, but how you do everything. Nokia on WP is not just telling Microsoft what they want/don’t. They jointly plan the future of the software and hardware. They have a common team of people who works through those. Elop says he can’t speak for the thoughts/feelings of other manufacturers on Nok/MS partnership but reckons they are happy that someone else is in WP, especially with the Google acquisition of Motorola.